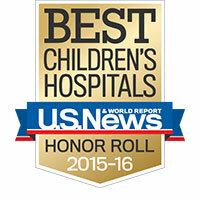 Congratulations to Cincinnati Children’s Hospital Medical Center for being ranked third in the nation among all Honor Roll hospitals in U.S. News & World Report’s 2015-16 Best Children’s Hospitals ranking! This is the fifth consecutive year at #3! We’d also like to congratulate Cincinnati Children’s Cardiology and Heart Surgery for moving up from #9 to #7! We are honored to be a part of such an amazing hospital so dedicated to becoming the leader in improving child health. The Best Children’s Hospitals rankings highlight the top 50 pediatric facilities in the nation in 10 specialties. Based on a combination of clinical data and reputational surveys of pediatric specialists, 83 of the 184 hospitals surveyed ranked in at least one specialty, while Cincinnati Children’s ranked in all of them.